Recently some members of Oregon Save Our Schools who hold graduate credentials in teaching English Language Learners (ELLs) had a conference call with Stand for Children’s Executive Director Toya Fick and Government Affairs Director Iris Maria Chavez. The call came about after Stand reached out to an OSOS member in response to a Facebook post questioning Stand’s path to helping ELL students. Specifically, that post questioned some of the original contents and intent of Stand’s work on House Bill 3499. House Bill 3499 in its current form is a result of the work of many people working in coalition. The bill has multiple provisions to help ELL students. Stand’s position from the beginning was to cut the extra funding that is currently given to districts to provide extra help for ELL students if those students did not reach a certain proficiency level within a certain number of years. Stand basically called for a one-size-fits all approach that would require all students to learn English within the same time period. They also actively advocated for more “accountability measures” to put pressure on school districts to boost exit numbers from ELL services without providing additional resources. The phone call was somewhat unproductive, with Stand repeating the same talking points they have used in recent testimony and propaganda. One of the tactics that Stand has used is to provide anecdotal evidence in the form of finding ELL students and their parents to tell legislators what a horrible experience they have had in public school. Surely there are ELL families who have not had good experiences in certain schools, but research shows that being in ELL classes actually helps students learn English. Historically, the problem that English Language Learners have encountered in the US is that they were not provided enough services, not that they were provided with too much service. And while it is true that students who exit ELD programs prior to entering high school have a higher graduation rate than those who don’t, Stand for Children’s originally proposed solution of merely cutting of funds for students on a predetermined schedule is no solution at all. Students do not exit ELD before high school for many reasons: some are dual identified as Special Education and ELL; some have an entry date to the US on paper that does not accurately reflect the amount of time they have been in a program or even in the US, as they may have moved from school to school, or even back and forth across the border during that time; some come to the US later in their school careers and do not have sufficient time to learn English prior to getting to high school; some come from situations that have been traumatic or have had interrupted schooling and are not literate even in their first language; most are students who live in poverty. While the Stand for Children representatives who we spoke with insisted that Stand had not advocated for cutting off funding after a certain number of years, nor stated that districts retain students who no longer need to be in ELD in programs in order to reap some sort of financial benefits, you can see that is not accurate in this blog post by former Stand Executive Director, now Chair of their Advisory Board, Sue Levin. In this blog post, Ms. Levin frequently confuses correlation with causation and misreads, glosses over, or skews the statistics she cites. Some of those statistics may be troubling, but when our experts see them, it raises more questions about what the true problem is than it provides an answer or a solution. Something else Ms. Levin fails to mention in her blog post, or perhaps doesn’t understand, is that ELL students are those students who have demonstrated that they are not yet proficient in English. The group “ELL students” does not include those students who originally entered school as English Language Learners (ELL) and have now been exited from ELD programs. Those students are no longer classified as ELLs, since they have attained English proficiency. ELL students, by definition, have not yet attained a native-like level of proficiency and therefore, one would not reasonably expect them to pass a grade level test of English Language Arts. Oregon Save Our Schools believes that students who have not yet reached English proficiency should not be required to take a such a test, which does not measure their reading and writing ability but rather re-measures the fact that they have not yet reached that level of English language proficiency. Develop a uniform budget expenditure coding to make sure funds are spent on ELL programs. Hopefully, the results will dispel the assumption that ELL money is not being spent wisely. OSOS believes that the problem is not how much money is spent, but the lack of it to move the dial for the most vulnerable populations. Establish a work group with a greater diversity than previous work groups. The group will develop ways to support exited students and better define the identification and exiting criteria from English Language Development programs. It would also establish a system to help schools based on the focus and priority model for schools in general. 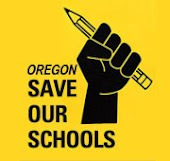 Oregon Save Our Schools does not believe in the focus and priority model, as it allows schools to be labeled “successful” while still leaving students behind and labels as “unsuccessful” schools that have the highest percentages of students who come from difficult circumstances. It is hoped that this work group will be scheduled for a time when educators can attend in order to include the voice of those who are true experts in the field. Provide funds to implement the State ELL Plan that looks to identify successful programs. Caution is urged in this identification. Programs that can be replicated for long-term success in diverse districts need to be found. Examine the lack of meaningful accommodations on statewide summative assessments. The SBAC will have such a low passing rate that we will not get useful information about the performance of ELL students. ▪ In developing criteria to classify programs as low performing we should not focus on how schools are classified under the current measures of state report cards that rely on a single high-stakes test. Given that most ELLs are predicted not to pass the SBAC, these measures would continue to label all schools as failures. When looking for exemplar programs for replication, we should not rely solely on anecdotal evidence only to determine success. ▪ The traditional technical assistance offered by ODE using the focus and priority model has not resulted in increased achievement for ELL students or narrowed the achievement gap. We need to look differently at how technical assistance will be delivered to ensure it will specifically benefit ELLs. ▪ Giving ODE the ability to mandate how the district will spend its ELL funding as punishment for continued low achievement would not result in improvement. True improvement comes when a school community works together, perhaps with needed outside support, to develop their own plan. We are encouraged that this bill has a tone of supporting rather than punishing our way into success. Mandates haven’t worked. We assume the good intentions of all educators who work hard in the trenches every day. We hope that the representatives from Stand for Children that we spoke with were simply unaware of the proposals that Ms. Levin had advocated so strongly for and are ready to move forward and figure out what actually will work to help ELL students be more successful in the long term.